Crofts estate agents are delighted to offer for sale this spacious detached bungalow which is located within the village of Habrough. Offering flexible living throughout this property occupies a generous plot and will appeal to a variety of buyers. Requiring a scheme of modernisation but priced to reflect Habrough also benefits from excellent road links and rail links. Internal viewing will reveal the entrance hall, lounge, dining room and kitchen. There is also the shower room and off the kitchen there is a timber framed lean to conservatory. 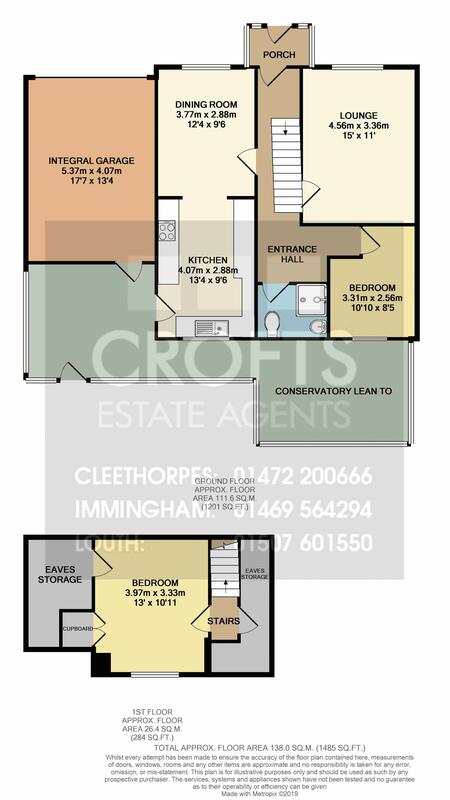 To the first floor there is another bedroom and multiple access doors to the eaves storage which subject to the necessary planning could offer further living space. Externally there are gardens to front and rear, a driveway and garage. The property also benefits from gas central heating and partial uPVC double glazing. Entering through the entrance porch reveals a radiator, carpeted floor and built in storage. The lounge has a window to the front elevation, coving to the ceiling, two radiators and a carpeted floor. There is also a feature fire place. The dining room has a window to the front elevation, a radiator and carpeted floor. The kitchen has a window to the rear elevation, door to the side and tiled walls and flooring. There is also a range of fitted units, sink and drainer, dishwasher, oven and hob with extractor over. Off the kitchen is this area which flows across the back of them property and also provides access to the garage and rear garden. Bedroom one has a window to the rear elevation, a radiator, carpeted flooring and built in furniture. The shower room has an opaque window to the rear elevation, tiled walls and flooring and a radiator. There is also a WC, basin and shower cubicle with electric shower. Carpeted stairs lead to the first floor and access to eaves storage and bedroom two . Bedroom two has a window to the rear elevation, a radiator and carpeted floor. There is also access to eaves storage and a storage cupboard. The garage has an electric door and light and power. The boiler is also located in the garage. The property occupies a large plot with gardens to front and rear. Although over grown the gardens really do offer plenty of scope to be a truly wonderful area. To the front there is also ample off road parking and access to the rear garden down the side of the property.